I had two options: One required me to spend money. The other cost me nothing and gave me an opportunity to make something useful. To make a short story longer, I have an “analog” slow cooker (just a dial on the front) and I wanted the ability to set the cooking time and temperature. Now I could have just gone out and bought an appliance timer, which certainly would have done the job. But that wouldn’t have given me temperature control. I had a few bits lying around from other projects, so I decided to smash them together and see what happened. Since I would actually be using the slow cooker for its intended purpose, I really wasn’t concerned with being able to set the temperature to the exact tenth of a degree. Being able to select Warm/Low/Medium/High would be fine. 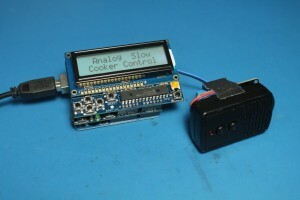 Instead of modifying the slow cooker, I would just set the dial to High and control the AC power connection. Having played around with Adafruit’s SousViduino project a while back, I would use that as a starting point. There, I modified a wireless outlet remote control such that I could control it with two GPIO pins. This allowed for the actual mains power switching hardware to be completely isolated from the controller. I’ve used this trick several times to great effect. This time would be no different. With the AC power control figured out, I considered the User Interface. I opted for something simple. The Adafruit RGB LCD Shield would work well as it had both a display and buttons built in. 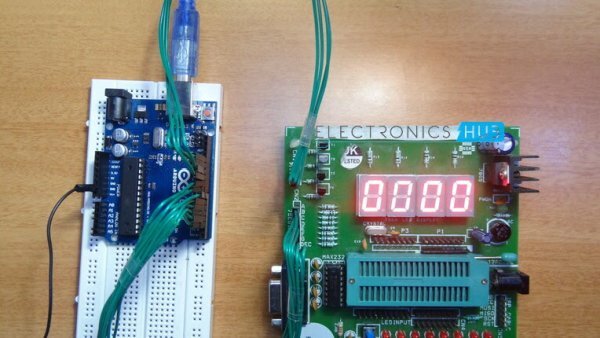 Sure, I could have beat this project about the head and neck with “IoT”-this and “ESP8266”-that, but I was feeling lazy and just wanted a simple timer control. Of course, there’s nothing that says I won’t add some kind of wireless connectivity, but for now, local control is fine.